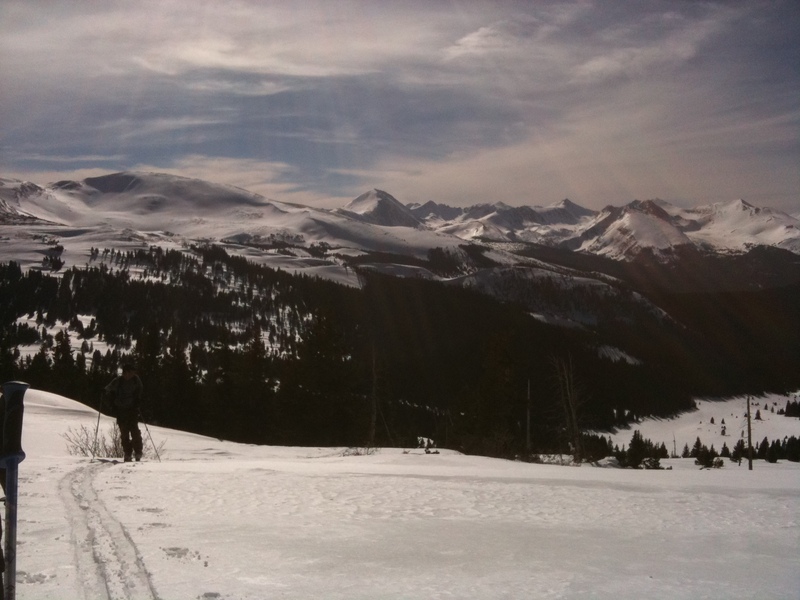 It started early that Monday April morning as we prepared to leave the island and drive over Vail Pass in aim for Breckenridge and the Boreas Pass area. I had purchased all the food, alcohol, and everything the day or two before and had it all split up and packed away in my 2 backpacks for the journey. I picked up my friend Arty for his first hut trip and he quickly threw his skis in the truck and put his avy gear and personal supplies in the big pack that I loaned him. It was already packed with survival staples such as sleeping bag, clean pillow case, beers, bacon, hand sanitizer, peanut butter M&M’s, mole skin, extra headphones, and a deck of uno cards. He was cherry popping excited as he fondled through all the supplies and goodies, not yet fully grasping the thought of hauling all this nearly 7 miles up up a long slog of a mountain road to the Continental Divide. I was excited to get the hell out of dodge for a couple days and put the March madness of big crowds and big attitudes behind me in my rear view mirror. As I smiled in the rising sun of excitement, I could see out of the corner of my eye as Arty looked up and back towards East Vail and the chutes like a sad dog that left his best bone buried in the back corner of the yard, which was also covered with a fresh 9 inch report. I assured him no fear with the reggae satellite channel, The Joint, blaring no worry as I told him how we were going into the wide open for self propelled, self sufficient, self indulgent moments of joytime kicks and aesthetic grandeur. He rolled his eyes still wondering if we should of tried to sneak in a powder lap then hit the road. It was a great start up the trail under big sunshine, skinning through fresh sparkle filled crystal covered tracks and rich blue skies. We saw a couple people snowshoeing and one guy cross country skiing during the first couple miles. They all seem to be carrying big smiles and big ladles so they could scoop out and drink up all that clear Colorado spring beauty after such a long heavy winter. The views were awe-inspiring as we shifted from dramatic overlooks of Breck like they were shooting the commercials to the forward focus of the towering peaks ahead. With that and all the good beats coming from the headphones it was easy at first to forget about the 35lb midget on your back. That was until the sticky icky started to invade my climbing skins. I hadn’t got the fresh coat of the purple spring glob stopper wax on yet, like I had planned. I searched through my repair kit and the rest of my pack to no avail and was left to pay some sort of karmic toll tax the last 3 miles of the trek. Drying em out a bit and scraping em clean with a credit card would offer a few moments of slowed and hushed profanity. Otherwise I had to grin and bear it with no glide and a huge ball and chain penalty. Arty seemed to fare a bit better with the glop karma so he paraded ahead a bit. After the four hour haul the road turned to reveal our homey cabin at the top of the pass. It sat next to an old house, the Section House, that was used to house the railroad workers back in the day. The snow covered the cabin’s outdoor walls and windows up to the metal roof and made us feel as if we were climbing down into a dark cave as we entered out of the blinding intense sunlight. After a bag of cashews and jerky and a couple pitchers of grape gatorade we were shaking off sore shoulders and dismissing the poor application of sunscreen. We began to unpack and sort out some of the goods trying to keep the meals portioned and organized and chilled. We got the wood bins filled, the fire started and stoked, and more snow to melt for water. The art of hut tripping is found in the balances. The balance of chores and kicking back, the balance of carrying it all and consuming it all, the balance of rationing and gluttony, the balance of the big things and the little things, the balance of the up and the down. By this time we were as rested as we were gonna get, so we headed up for an early evening skin before happy hour. I had found my glob stopper in the first place I had checked for it, so my skins were like new and improved as they cut through the late day spring whip cream with no drag or penalty. We climbed an hour or so kind of north and west above the cabin, where we spotted some areas across the pass to shoot for the next day. Hung out on the rocks a bit working on the goggle tan and finishing that great grape snow melt gatorade. We skied down making lovely poetic haiku turns in the warm creamy snow smiling through sun hats and shades like a monk with his robe wide open in his perfected zen garden. At the road we pushed back up another 10 minutes back to the cabin. We cracked the first beers in celebration of a great day in a great place. That beer tastes so good on a high mountain pass with a feathery breeze as you watch the sun begin to paint the increasing clouds as it drops to the west. Just the mini speaker spouting some Neil Young through the cabin door, we set in the section of dry grass and all feels right with the world as the sun sets and the purples and pinks smear the sky with the colors of warm goodness. Arty puffs on a nice Black n Mild cigar as I run in to mix a drink. (one can’t afford to carry just all heavy beer – but it is essential to start every evening with a couple on the continental divide’s stone beer garden patio of wonder.) I come running back out to catch the sky’s finale with cigar in mouth and two fresh vodka lemonades in coffee cups with roof ice and real wedges of lemon and lime. Arty laughs in a loud cheer and delight in approval of the drinks, cabin life, and the simple pleasures. Happy hour stretches and blurs into dinner time as I prepare my hut staple value meal plan #1 of pulled pork bbq sandwiches on bagel thins with bag o caesar salad and full size snickers bars. We escape the fiery wood stove wrath by stepping out for a final smoke and nightcap of crown royal shots under the stars. We awake late after a hard 10 hour hibernation the next morning. With door open we notice the local neighbor couple from Breck in the section house that arrived after dark were already heading out. I hadn’t even did any light reading in the outhouse or cleared the pile of lemon and lime wedges from my coffee cup yet. The day got going slowly with lots of coffee, a whole package of peppered bacon, and some bagels and cream cheese. After breakfast dishes and some re-supply of wood and snow melt we headed out for the day. I broke trail first and then Arty led the boot hike up from there. It felt kind of good to hike since it had been a while since I had scrambled any real distance in a while (Although I am a much bigger fan of skinning than boot packing). We got to the first peak and it helped put our lofty goals in more perspective as the direction we planned on going was null of snow and hidden from yesterday’s view. 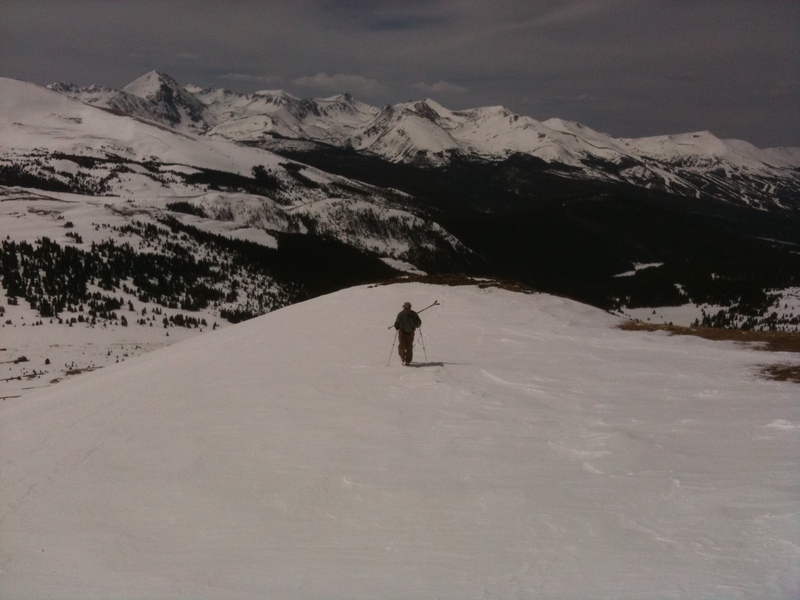 Instead of down climbing we chose to re-route and ski some lightly defrosted corn under the mostly cloudy skies. 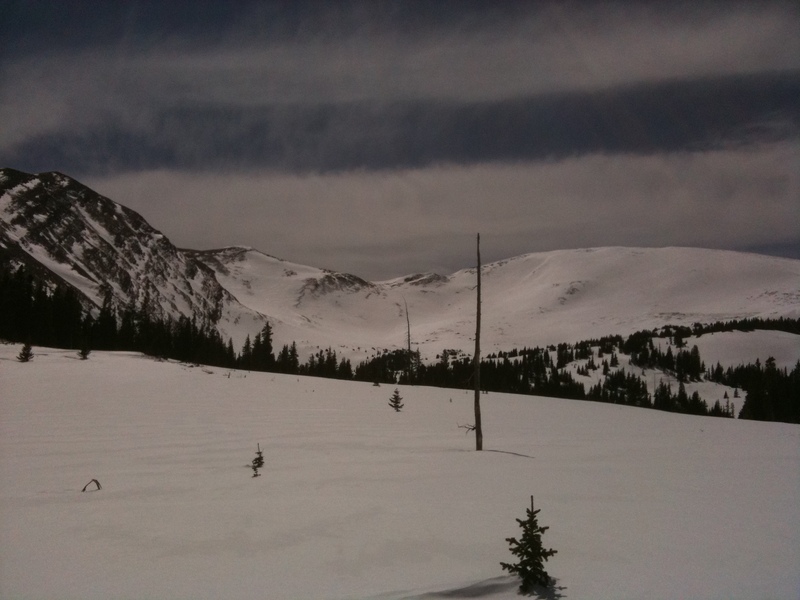 We skied down to the last saddle and traversed around the skirts of the peak we just hiked up. Here we found more wind affected colder snow and a couple cross loaded traverse sections we tried to stay high to avoid a little sketchiness. After the traverse we transitioned over for a few minutes of skinning up to reach the upper bench in order be able to drop over into the next cirque to the southwest. That snow was more sheltered in the big trees and was more soft but thick, resulting in a few good wavy slash turns through the woods and out into the open. By this time we could see our new re-established goal after a couple hours of route finding and rearranging. We skinned another 45 minutes up a long ridge to a big corniced area. 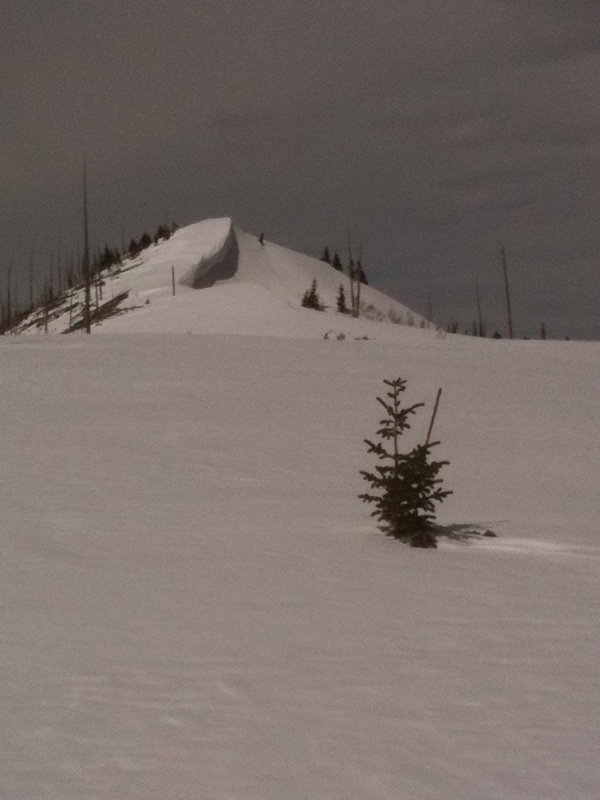 Only person we saw was a solo snowmobiler getting after it a bowl over to our left. It felt great and satisfying to be up top on a face we looked at from way afar yesterday with more of a wish than anything. The face was kind of gnarly with a couple obvious avalanche paths spread between three separate semi consolidated ribbons of trees that seem to provide some islands of safety. 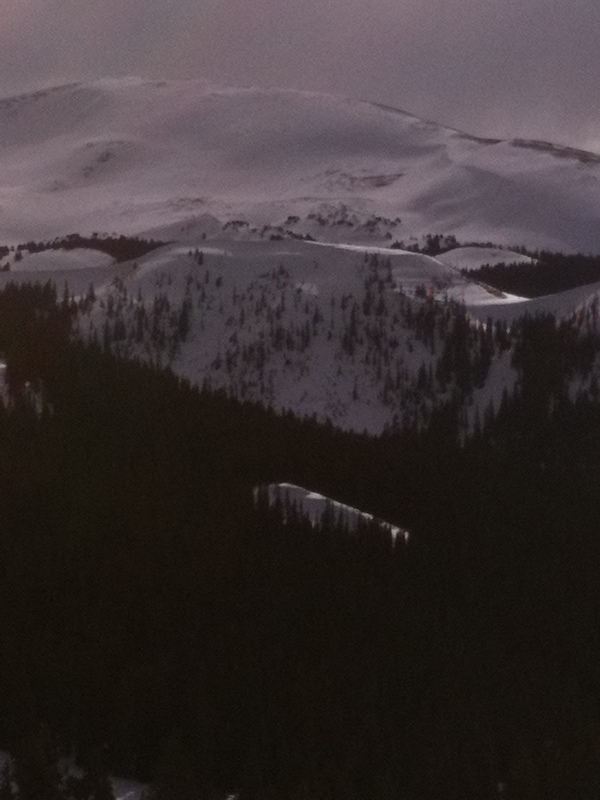 We kicked at the cornice and Arty sawed a good chunk off and dropped it on the skier’s right section. Nothing moved or showed any energy at the top but we still had a lot of concern about the convex roll 50 yards down that was puffed up and cross loaded. Neither of us felt good about it so we moved over the ridge a bit and avoided that section and skirted the cornice drop. 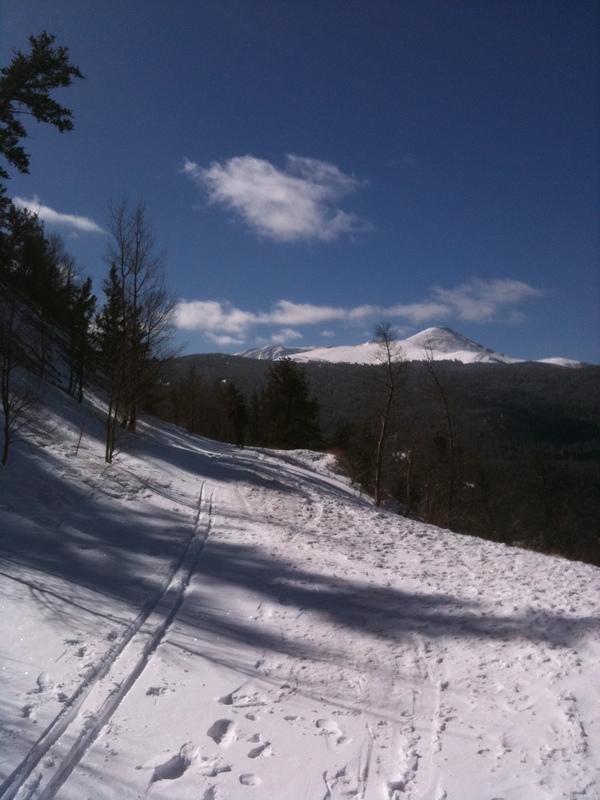 Arty’s first turns showed me the hardness and crustiness that awaited me on that initial steepness. After Arty reached a safe spot in the ribbon of trees, I dropped into that funky monkey surface party and laid down a couple ugly and sluggish survival turns past his safe spot. We leapfrogged each other in the few trees that were around and generally chest bumped the man crust as strong as we could blowing out on to the gentler machine gun apron and down to the soft serve gully. Not the best blower quality turns but what a rush and kick in the pants. After a nice long power break of dried fruit and slim jims we donned the headphones, drank the last of the water, and headed up a couple mile skin back up to Boreas Pass Road and then another 40 minutes back up to the deserted cabin and section house. It had been an almost 7 hour day of gettin after it on all kinds of conditions. The full circle route of sort was so rewarding as we stood around the cabin during apres with victory cigars and cold drinks. Seeing where we went towards making it happen and keeping it real with nothing but ashes and tracks. You could see it in Arty’s sun burnt face, that he had seen the light of a good hut trip and was going to come back a new kind of mountain man. We refueled that night on the b team dinner of chicken noodle soup with saltines, mashed potatoes with cheese and bacon crumbles, and summer sausage sandwiches with mayo. (Remember it all shines in the fine details of quality extras and condiments.) We recycled the last of the beer cans and the plastic vodka bottle after the dishes were done. The night was waved in by some steezy John Scofield jazz and a hearty desert of chocolate, crown royal, and the sleeping pill of one’s choice. The next day was greeted by another amazing sleep in. Don’t doubt the power comfort of a good buzz and Ken’s Cabin when the snow covers the windows. We hustled through the morning shuffle of bacon, bagels, and coffee in order to get the cabin swept out, restocked and wiped clean before exit. However, before pushing off that 6 2/3 mile downhill we had to go up for one more. You gotta get up to get down. We skinned and boot packed almost an hour directly above the cabin for one more shot at a nice thick snow ribbon off the wind charred divide. 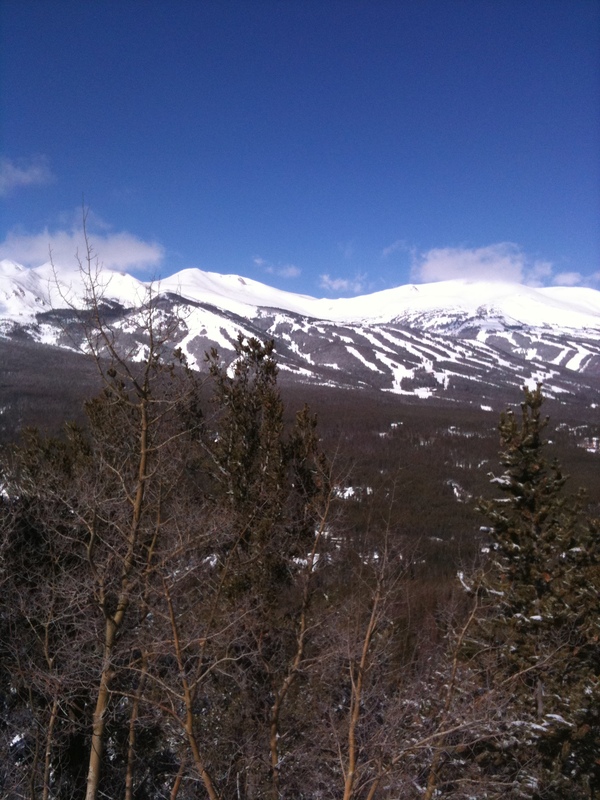 We rested for a short bit looking out above the cabin and all of Breckenridge. What a great couple days to leave the rat race all behind for simple pleasures, good travels, and great views. 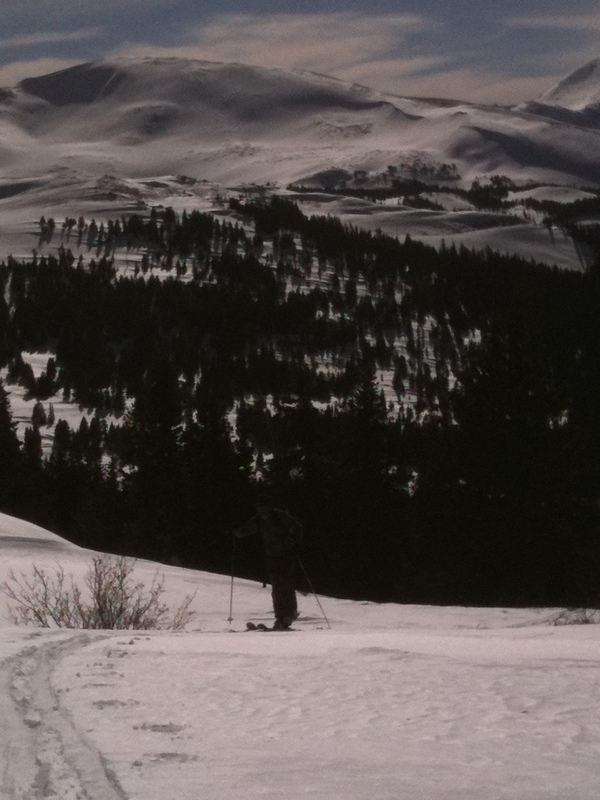 It was a nice shot for some soul skiing that was firm at top and softer and chewy at the bottom. With a quick power break to re-load our stuff we stashed in the wood shed, we were off under a darkening cloudy sky that was calling us back west. The road turned to a nice crusty snow cone that enabled us to cruise out at a good glide where you can push you’re extended poles along and just let your mind wander, and sit back and enjoy the ride. Cheers and hope everyone has gotten a few chances to lean back enjoy the ride this year.